One of the intriguing stories of Campaign '08 is the popularity of Hillary Clinton with black women who might be expected to support Illinois Sen. Barack Obama, the first African-American to emerge as a serious contender for a major party presidential nomination. A series of CBS News polls show the New York senator has a 15-point lead over Obama among black women. Other polls have confirmed Clinton's popularity with African-American women. Overwhelmingly, the most frequently stated reasons women give for favoring Hillary Clinton are that they have positive feelings about her husband and his administration and they think she's got the best shot of any of the Democrats to win against the Republicans. "Most Black women simply believe Clinton can win," said former Gore campaign manager and Democratic strategist Donna Brazile. "They loved her husband Bill and would like to see 'a woman elected first'"
Obama hopes to find the antidote to Clinton's less-than-secret weapon - husband Bill - with a boost from talk-show queen Oprah Winfrey, who is campaigning for Obama in three early primary states: Iowa, New Hampshire and South Carolina. But beating back Bill won't be easy. As much as African Americans may instinctively roll their eyes in exasperation when they hear Bill Clinton referred to as the "first black president", it is undeniable he made an emotional connection with black America in a way that no other president has. Sheryl McCarthy is a columnist for USA Today and Newsday who often explores issues of politics and race. "Black people have always felt with Bill Clinton that he is sort of one of them, "that he cares about them, that he can relate to them," she said. "And after he left the White House", McCarthy observed, "he put his office in Harlem. So black people have a real connection with Bill Clinton and may think there's sort of a continuum with Hillary Clinton or similar sensibility with Hillary." Mark Sawyer is director of UCLA's Center for the Study of Race, Ethnicity and Politics. He pointed out Hillary also enjoys a halo effect from the fact that black Americans felt more confident economically during the 1990's. "Relative to other years, other presidencies, African Americans did very well under the Clinton administration, though there's substantial evidence that they perceive themselves to be doing a lot better than they actually were," he said. Hillary Clinton's White House years also gave her a forum from which she was able to raise her own visibility. Dr. Suzan Johnson Cook is an influential African American Baptist pastor who served as a member of Bill Clinton's Domestic Policy Council and is now active in Hillary's presidential campaign. "I got to know her as the first lady," Johnson Cook said, "and I got to see her work with health reform. She took on some issues, which was very courageous and the first time a first lady really dealt with policy." That time in the White House also put Clinton in the public eye as the long-suffering wife of a man with a roving eye. "It took a lot to hold up under that," Johnson Cook said. "I don't know how many women could have done that, but she did, so I give her three thumbs up." Success begets success, and the simple fact that Hillary Clinton is the leader of the Democratic pack in most national polls carries a lot of weight in the minds of black women. "She looks like she has a much stronger chance of getting the nomination and getting elected than Obama. You want to go with the winner, and if that's a woman as opposed to someone black, then you want to go with them," said Newsday columnist McCarthy. The Rev. Johnson Cook points out that the kinds of issues Hillary has tackled in her political service also make her especially attractive to black women. 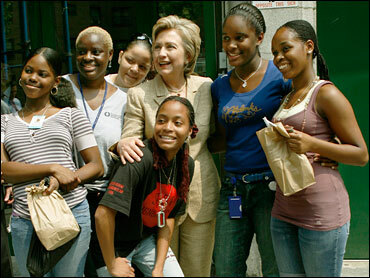 "Many of us are mothers and wives and family women, however you qualify us, and we know the track record of Senator Clinton with children, particularly poor children, and city children. When we look at someone who has a track record of voting that way and representing us and fighting for us and advocating, then she wins on the experience and the track record, hands down, no question, undeniably," she said. Race weighs heavily on the minds of black women, though not always in ways that have generated support for Obama. In a series of interviews in South Carolina, New York Times reporter Katharine Q. Seelye noted that black women often brought up a sense of fear for Barack Obama's safety if he was elected, describing it as "an almost maternal concern". "I don't feel the country is ready for an African American," one woman told her, "He would be killed." UCLA's Mark Sawyer calls that fear a kind of "proxy" for how significant voters feel racism is in the American public sphere. "It's a way of saying African Americans are concerned that if Barack Obama were to win [the nomination], there's just no way he would become president because there are 'forces' out there - racist forces - including perhaps the white electorate, that would make that impossible." "People do feel the assassination thing is very real," said Johnson Cook, "They do fear that for him. This is a topic that's on everybody's plate and around everybody's dinner table that I know." One point made repeatedly is that if many black women prefer Clinton over Obama, it's nothing personal. "I think we're being told that if black women are leaning toward Hillary Clinton that that's a negative perception of Barack Obama," Prof. Sawyer said. "African Americans feel extraordinarily positive towards Barack Obama, so choosing to put Hillary forth as the preferred candidate is a strategic voting choice and not necessarily an emotional choice." "I prefer Obama, but Clinton is stronger," said one black woman almost apologetically while out shopping with her sisters and their children. She feels that the current political climate just isn't right to test out a black candidacy. "I wouldn't want him to go into it as the first black person, because I think he would have a hard time, and he's such a nice young man. Believe me, he would get the brunt of everything. Everything is messed up and he would basically have to clean it up - and that's a lot for him to handle." Despite her pessimism towards his campaign this time around, she did express hope for the future, "He is young, he can do it again, he can do it another time," she said. "This is not the time, because it's a lot to clean up. Bush really left it in a mess, is my feeling." 3511485Beyond Oprah Winfrey's very high profile endorsement, it isn't difficult to find black women who do have confidence that Obama is ready to take on the establishment, not someday, but now. Livi, a black woman from Long Beach, California argued that Obama has proven naysayers wrong in the past. "The fact is, people have said…that he wasn't electable in terms of the Senate and there have been other races or other things in his life where he was the underdog." "People say, is this country ready for a black person, an African American, to be president. You know, I think that this time is as good as any." Livi's 32-year-old daughter Maryam agreed. "I actually like Barack more than Hillary. I just don't trust Hillary as much as him. There's something about her that's very political. I think that it's nice to have a new face, a new energy, someone who can bring in some change." "It's just like we got behind Clinton," Livi added, referencing not Hillary, but Bill. "He was like the new Camelot the first year he was in office. I think I would have the tendency to get behind Barack for that same reason - that if we want a change, let's go ahead and really vote for the change." Sheryl McCarthy concluded that for her, it comes down to a pragmatic choice as opposed to an idealistic one. "I don't know that people are happy with the three front runners. I'm not happy with the three front runners. I'm very disillusioned with Hillary, I wish John Edwards were doing better, I'm not quite sure why he isn't, and Obama just sort of floats there, like I said, what's not to like about him?" More and more Democrats in Iowa are telling pollsters that they really do like Obama and now that Clinton's lead has dwindled in what is essentially a white state, there's still time for voters on the fence to reconsider his electability. "If he were to do a big surge and come out as a real, real serious contender with Hillary Clinton, sure, I'd probably switch to him," she said, "but I don't think that's going to happen."